Preeti Shenoy tagged me long back with a tag of 8’s. She is right, its hard. Stuff I never thought about in my whole life I had to think up now. It took me 2 whole days ++ to put this together. I don’t watch them everyday but do try to catch them whenever I’m free. 4. Nandos, Dubai – A favourite with the family..
5. Nagarjuna, Bangalore – The combination of chicken biriyani, chilli chicken and pepsi enjoyed just before the noon-show at Galaxy next door is unforgettable. 6. Ebony, Bangalore – The food, the view and the company made it memorable. 7. Asha’s, Dubai – for special occasions. 8. Shaanbag, Residency Rd, Bangalore – their Special Masala Dosas were amazing. 1. A short holiday before the year ends. 2. Watched a movie “Fool’s Gold” on Zee Studio I think. 3. Made Penne pasta in Alfredo sauce for the 1st time & it came out good. 4. As I was coming back home after picking the kids from the bus stop we saw our next-door neighbour carried out in a wheel-chair. He’s been sick for sometime now. 5. Went to the stationary shop to pick up some pictures of birds and some clay. 6. Watched Nikita make a clay peacock for a science exhibition. I have no idea where this peacock fits in but she is quite sure her teacher is going to love it. 7. Better-half sprained his back…….again. 8. Saw lot of flashing lights thru my kitchen window late last night. Opened the kitchen door out of curiosity & looked down…there were 3 police cars. At first I thought it was an accident scene….looked more closely and realized some guy got caught with a lot of liquor in his car[Liquor etiquette in Dubai : One cannot just go to a store and buy it off the counter, you need a separate license to pick up liquor here. So the next convenient thing(esp for the lower income groups) is to buy liquor from guys like these who sell them out of their car but you got to know where they park their cars]. I’m not all that fond of the cold but after 9 months of summer one tends to appreciate the change in temperature. Anyways, let me see what I can come up with…. 1. Kooddling under the blanket[thts how the kids use to pronounce cuddle at first and now its stuck] with the better-half and the kids on fridays. 4. Looking forward to wearing brightly colored warm clothes which are otherwise packed away. 5. Winter is also about looking forward to going home to celebrate Christamas and New Year with family but this year it’s just us since we already went home in July. 6. Lots of shopping is also associated with winter mainly because of point no. 5. 8. Eating Butta[corn] seared on coals with spicy green chutney. 4. Did you see that???? 5. You better have a good explanation ready…..
8. I have a headache….ok, ok just kidding;-D.
1. Never say “Eeeks, I cant imagine myself doing that”. There's a good chance that you will end up doing it atleast once. 5. Have some chocolate when you are feeling blue. Things start looking better even before you finish the bar. 6. Whenever you are caught in a cross-fire of words, Silence is the best weapon. 7. Do not wait for things to happen to you, chances are you’ll be waiting forever…like me. 8. If all else fails, press control+Alt+Del….in short, reboot. Phew...its done!!!!! 1 or 2 of the questions sort of kept asking the same things over and over again. It was so tough to dream up new stuff which are true;-D.
I'm sure all this must've reallyyy taken a lot of thought..and what fun! You chose to tag me..Awesome!! Will definitely come up with the replies..but I do deserve a fair amount of time right? And take ur time...this one's particularly difficult. First thing: Nikita's peacock is awesome, perfect in my eyes- pl tell her that!! Now don't tell me you helped. I loved your 8 things you learnt from the past! But, chocolates and weight loss?? By the way, please include me in your hunt for a pair of fitting jeans ;). Nigella - Give me a 5 on this !!! Its my most watched fav TV show !!! We dont appreciate our parents, till we get married and learn what it is like - maintaining the whole household !!!! You've brought up briyani topic in ur blog page, just the time I've just forgotten abt it - now the temptation begins. That is one awesome clay model peacock - the teacher better appreciate the effort and put it up in the science exhibition. Otherwise, Nikita, just call Uma aunty, I am flying to come & take care of that teacher. Those 8 things learnt from the past - gud ones, really liked them and they made real sense, for the today's world - you know, we are filled with stress and silence is the word for it. Even your tags are interesting to read and make me comment so much - thats what I like in ur blog pages...lovely read, Nancy. Life with the better-half ...u wanna get old so fast ?????? This was fun reading!!!! Especially liked your lessons from the past. And lol on "I have a headache" :D Oh & Nikita's clay peacock looks great, super imagination on the tail!!! Couldn't think of anything interesting to write so you send this Tag my way :) Now I gotta find time to do this tag ! Try putting mushrooms in the Penne Alfredo...lovely! Love your list! I'm watching taped episodes of Nigella on youtube. It's almost like an indulgence to watch her cook. You watch all that on TV? wah wah...the only program I watch regularly is Oprah and anything on food network while I am ironing :(. That peacock is gorgeous..lolz at her imagination for sticking colourful dots on the feather. I thought at first those are Smarties candy!! Wow butta and chutney...need to have one of those today as it's downright chilly here. Uggh no plans of visiting Uncle sam's country? This part of the country is very very pretty...can assure you that! Thank you for doing the tag. The peacock is soooo beautiful! My compliments to the little sculptor. You did the tag well. I loved going through your lists of 8-- and wow- you have nandos there? We used to have it over in ghana,it was one of our family favs too. Also would love to wake up and miraculously lose a pound :) ha ha! Your daughter's peacock was impressive. Also found the note about the alcohol purchasing there of great interest. I had no idea about this. I also wish i was staying in the same city as my parents- oh my how I wish that!!!!! All in all, a wonderful set of 8's for the various subjects mentioned. Liked what you wrote about 'Things you learned from your past', the 2nd point hit sooo close. I can tell you where you can go for a cool haircut - there's this salon in Barsha (Tulip Inn Hotel), he's too good and he'll make you look totally different! Try it! That was fun to read, Nando's is our fav too. Haven't tried Asha's, is it really that good? Made Penne pasta in Alfredo sauce for the 1st time & it came out good. Yum!!! Watched Nikita make a clay peacock for a science exhibition. I have no idea where this peacock fits in but she is quite sure her teacher is going to love it. I love it too :) Well done Nikita! Better-half sprained his back…….again. Ohh :( Hope he is feeling better now! Have some chocolate when you are feeling blue. Things start looking better even before you finish the bar. - This is the best !!!! Ums: Loved what u had to say abt the parents bit. Its not like I dont know it but when somebody else says it...sort of comforts. Thank U so much for the beautiful and thoughtful comment....it makes doing the tag soo worth it:-)). Anishthomas: "you can transfer some weight to me"
Hehe...there is a very wise saying abt being very careful what u wish for as u may regret it lifelong;-D.
Sindhu: Seriously this tag was a bit tough...u knw, made me use tht brain which was rusting up there;-D.
Asha's is great...I love the ambience and the food is lovely, atleast whatever we've ordered till today has been good;-). Rakesh: Everybody is getting the wrong idea here...I dont watch WWF because I like to. I can barely tolerate the nonsense but the husband follows the drama with gr8 enthusiasm....if they keep screaming 'Jeff Hardy this' and 'the undertaker tht' every single night one is sort of following the show by osmosis;-/. I wondered if u'll get it why I sent the tag ur way;-). The Girl from Lokhandwala: I added chicken this time. Will try ur idea next time, thanks:-)). And welcome to my space:-)!!!!! Prashanti: U bet it did. Hehe its not hard to guess why u r so preoccupied these days, ENJOY;-D!!!!! Rashmi: Oh yes it is and difficult too. I dont watch WWF willingly...I'm forced to watch it;-/. Anjuli: Not at all surprising u had 1 in Ghana coz Nando's is a South African joint. But quite surprised US doesnt have one or do they??? Blunt Edges: Aha did any of them hit close to home;-D???? Sunshine: Thank U....it took me so much time but in the end it was worth it:-))!!! Swaram: By now I know doing the tag in the comment section is a speciality of urs;-D!!!! The revolving restaurant is really a great place....it is located on the 25th floor of the hotel and revolves a complete 360 degrees every 2 hrs...and the view is awesome. With some good food as company the whole experience is out of the world. If u ever visit Dubai dont miss it:-)). Thank U for the loooong comment...I enjoyed it:-))!!!! Balvinder Singh: Sirji U r so kind...so generous with ur compliments....always. I'm overwhelmed. Thank U soooo much:-))!!!! I love Everybody loves Raymond! :D Nicely done tag! 2. Love love love India. 3. I think your kids are adorable. 6. I love jeans and tees. 8. I believe in the power of the perfect haircut. I need the recipe for penne pasta please....I'm drooling here already! 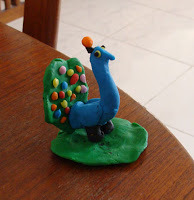 that clay peacock is beautiful,well done,Nikita! Have you begun decorating the christmas tree? *same pinch* for being passionate about rich chocolate cake..chocolate is my weakness! When you do get that perfect haircut,make sure you display it here so I can get some ideas too...I'm dying for a change in hairstyle myself! lol@mashreq millionaire, i remmeber ur last post on that! Hello there, first time here and a great way to start to know you. Lovely tag that says a lot about you. Looking forward to know more :-) Do take peak at my page when you get a chance. Glad to know you better Nancy. You sure do have a great personality. I loved some of them especially reading your lips NO :) I love sudoku and chocolates too(who does not love chocolates right?) ;) Hey, you tagged me. That is wonderful; this is the first time for me. Will get to it soon. I wish we lived close by, I want to learn swimming too. I went for some classes, but have not yet found a way to do it regularly and become good at it. And that peacock is so precious, pretty pretty. almost when I was thinking of taking a random tag, you saved me..
Will write the post first! Oh, I love reading about your daughters and thier karname! Suma: Oh I know abt the library in Karama...years back I used to go there but it is really so incovenient for me to go there every week...I so wish something opens closer to home. Smitha: A chocolate which would help reduce weight!" Deeps: Looks like I didnt explain it properly since everybody is asking the same thing....I dont watch WWF on my own free will, forced to put up with it, courtesy better-half;-/. The christmas tree shd be up in the 1st week of December;-D.
And yeah the temperatures have dropped here...good time to take the kids to the park:-)). Howz it in Doha??? ISH: I'm been thinking abt u. Good to see u back!!!!! AD: Welcome to my space and Thank U!!!! Lakshmi: I had a vague feeling u hadnt been....I love tagging people who havent done them before;-)). Seriously, I too am looking for company to attempt all these things...going alone is so intimidating...atleast for me. And will pass ur compliments on to Nikita:-))!!!! Swathy: Glad to be of help....looking forward to reading urs:-)). Yieeekkks... I was tagged months ago to do this one & managed to escape it smartly ;-) I salute you for completing it so well! I feel so good as I've been to 3 out of your 8 must-visit places!! And Nikita's peacock is lovely. I love the tail. Very good Nancy. You get 5 stars from me !! Cheers. Thank U...it did take me a few days to put together:-)). Let me guess, u've been to Wayanad[this I know;-D] and maybe Taj mahal. So which is the third place....the Pyramids???? Will convey ur compliments to Nikita:-) and thanks once again!!!! I've visited Eiffel Tower, Paris. sorry,Nance for this delayed reply. thanks for tagging though, Nancy. i need a haircut too..badly need one :-(....but have been too lazy to get myself to go to the salon...sigh. Sunshine: LOL who taught u that;-D????? Lostworld: Dont worry, even that will happen:-)). But how come u haven't blogged abt the Eiffel tower???? Titaxy: Now that u told me I sort of remember reading it;-D. And get tht haircut soon;-))!!!! Hey, what a coincidence! I was just going through your blog today & then I read your comments in my blog. Your blog has beautiful Kerala pictures! Really enjoyed them.